Although we often think about bacteria as something we need “wash off” so we don’t get sick, the truth is that bacteria is EVERYWHERE. And when I say that bacteria is everywhere, I mean that we are literally covered in bacteria both inside and out. In fact, we couldn’t live without bacteria as bacteria are instrumental in so many functions. For example, bacteria break down carbohydrates in our guts and prime our immune systems to fight infection. 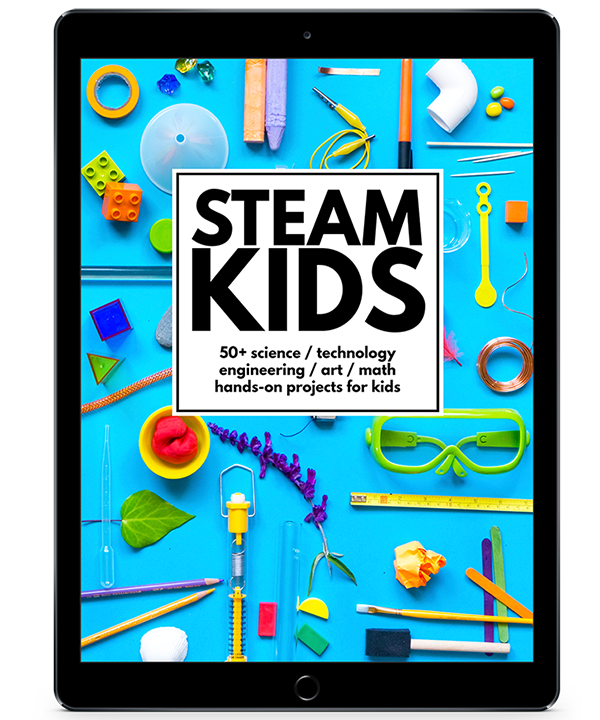 But how do you teach kids about bacteria when it can’t be seen with the naked eye? And how do you show them that bacteria is literally everywhere around us? Well, I enlisted the help of my mother (a retired, award winning science teacher) to help us culture and grow some bacteria. 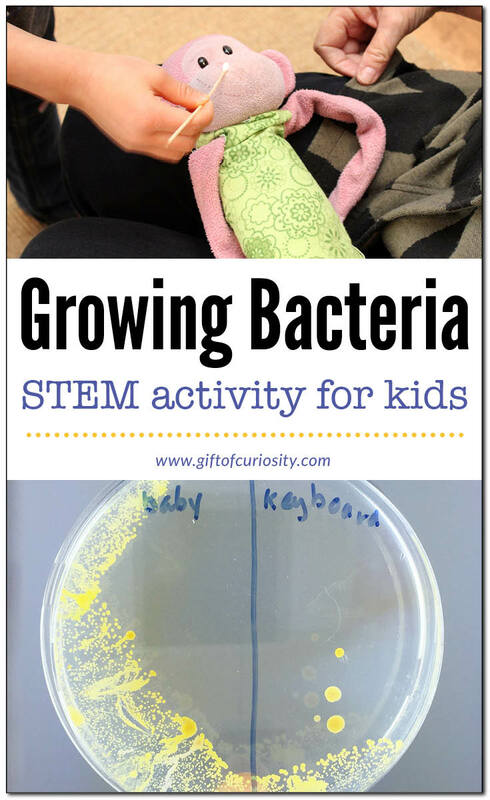 Growing bacteria in a petri dish was a very impactful activity for both of my children, making visible to them that which is usually invisible. We started by talking about how bacteria are single-celled organisms that are neither animals nor plants. They are so tiny that we can’t see a single bacteria with our naked eye, but we can see bacteria when it grows in clump-like groups. We discussed how there is bacteria ALL OVER. 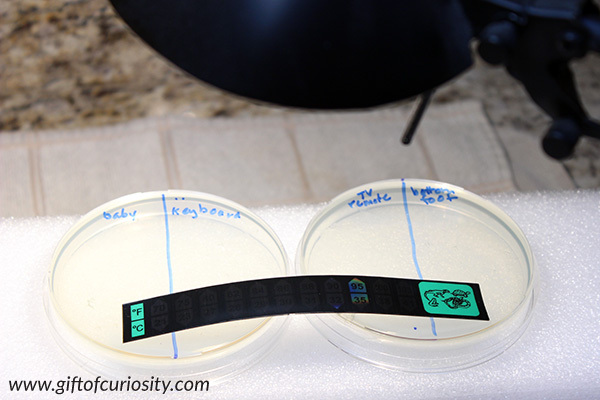 We brainstormed some places we might find bacteria, such as door handles, keyboards, dirt, etc. Then we told the kids were were going to grow some bacteria so we could see it. We were also going to discover what things carry more bacteria and what things carry less. My mom showed the kids how to swab items around the house for bacteria. 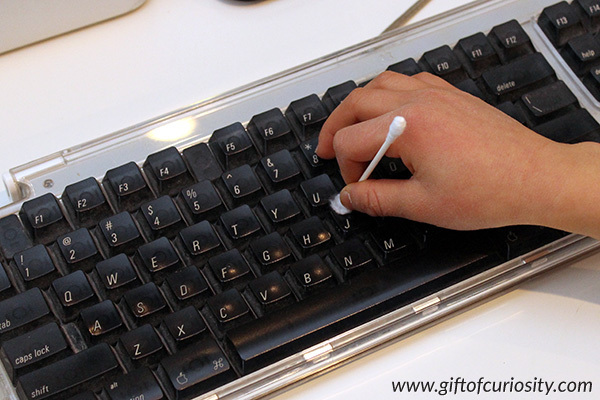 At first, for training purposes, we used q-tips to swab things like our keyboard. 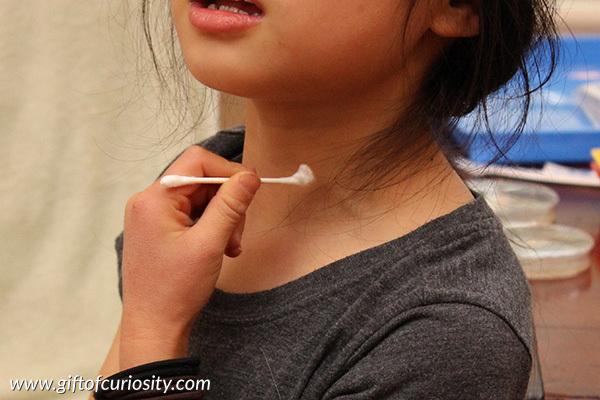 We also swabbed our necks. 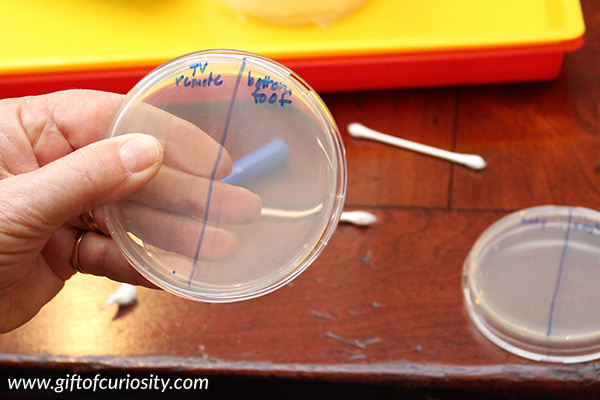 Once we were done learning how to swab for bacteria, we talked a bit about our petri dishes. A petri dish is a round, shallow, clear-colored dish with a lid used to culture microorganisms such as bacteria. I purchased a set of petri dishes that were pre-filled with agar, a substance that bacteria like to feed on. We labeled the bottom of our petri dish with the items we planned to culture. 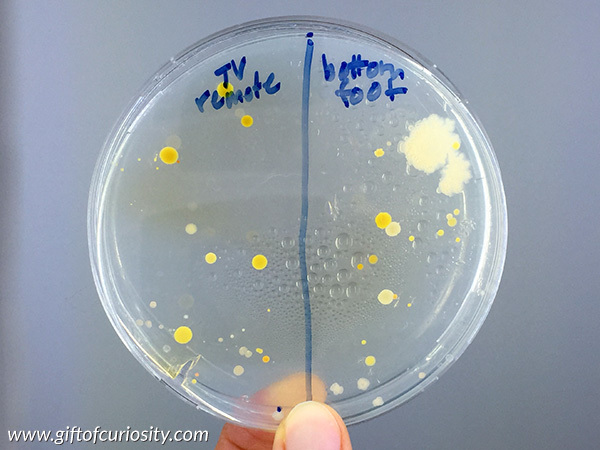 In the image below, you can see that we labeled this petri dish to grow bacteria cultured from our TV remote and the bottom of my son’s foot. 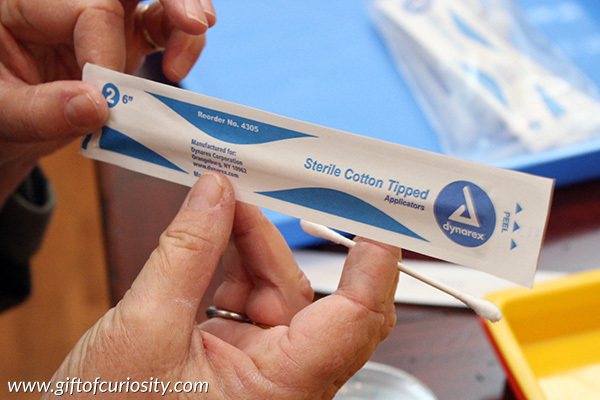 Next, we opened the sterile swabs that came with our set of petri dishes. 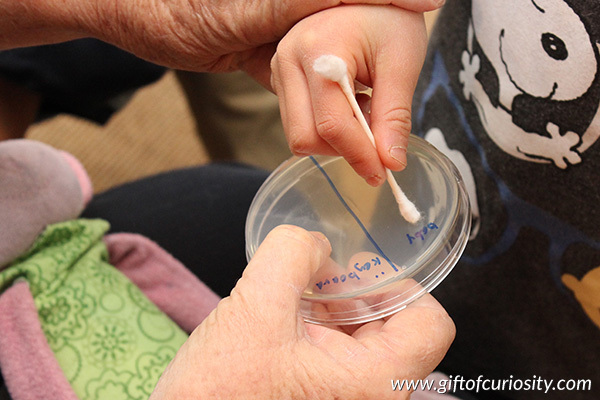 Now that the kids were experts in swabbing items, they used the sterile swabs to gather bacteria from several objects. 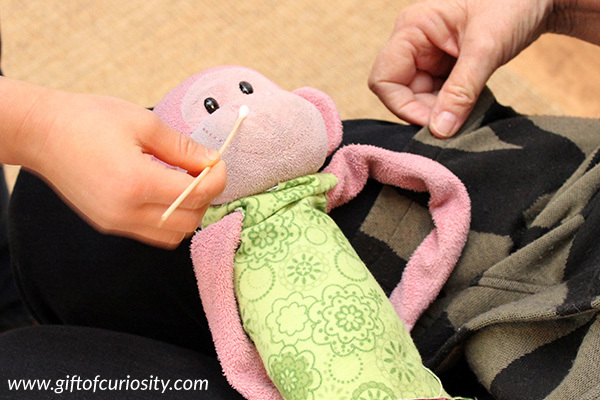 In the photo below, my daughter was collecting bacteria from Baby, her stuffed monkey. 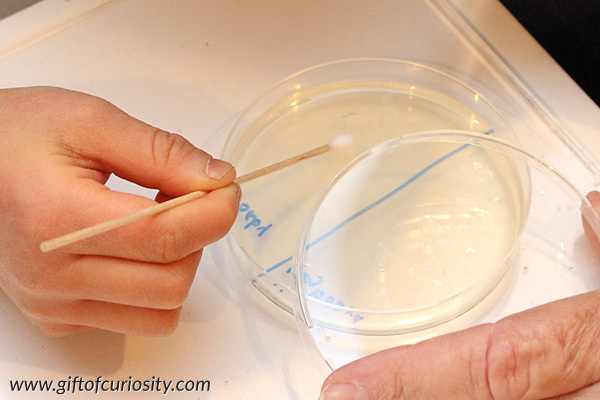 The kids then gently rubbed the swab over the agar in the part of the petri dish labeled for each object. It is crucial that you rub gently here so as to transfer bacteria to the agar without poking holes in the agar. After we cultured our petri dishes with swabs from several household items, we set the dishes under a desk lamp to keep the temperature around 95 degrees F / 35 degrees C.
If the temperature is too low, bacteria will still grow, but the process will be very slow. If the temperature is too hot (over 100 degrees F / 37 degrees C), some types of bacteria will not be able to survive. We used a strip thermometer (similar to, but not identical to, this one from Amazon) so we could ensure the temperature was just right. By the second day, we could see some bacteria growing in our petri dishes. And by day 6 (pictured below), we had a LOT of bacteria. These photos clearly show growth of multiple different strains of bacteria (as evidenced by the different colors and textures). 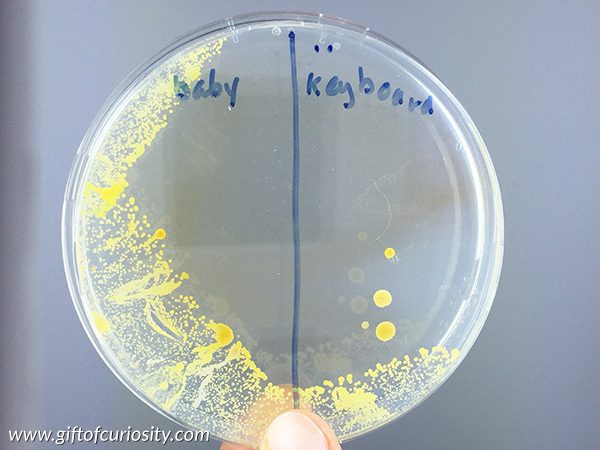 Of the four items we swabbed for our bacteria cultures, my daughter’s stuffed monkey, Baby, was the clear winner in terms of how much bacteria we were able to grow from that swab.